The Top Story of the weekend has to be Milan-Sanremo. We have all the fun of the Primavera with all the quotes from the riders, plus the race report, result and video. Mathieu van der Poel won the GP Denain and Pascal Ackermann won the Bredene Koksijde Classic. 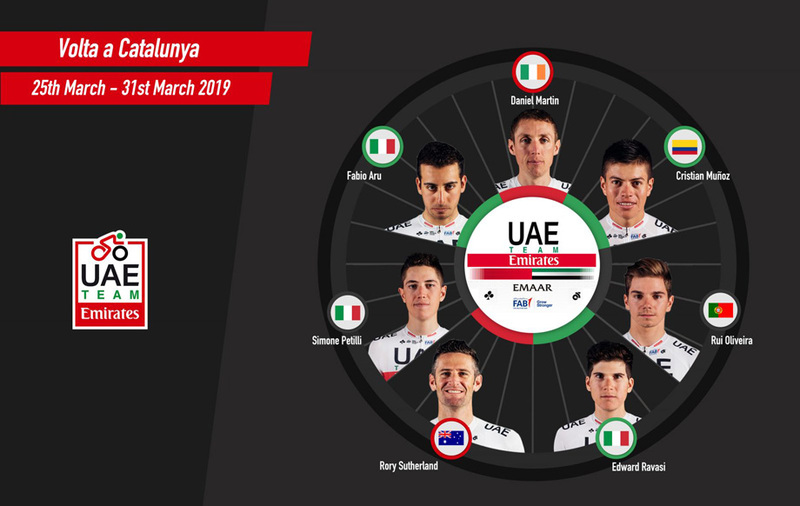 More team announcement for the Volta a Catalunya, teams for the 2019 Tour de France and Critérium du Dauphiné, Dani Martínez signs with EF Education First, Victor Campenaerts hour record part 4, OVO Energy Tour Series Returns to Redditch, Yorkshire lights up for the Worlds and Wanty-Gobert Launches 'Bike Day' in Binche. Monday EUROTRASH coffee time. 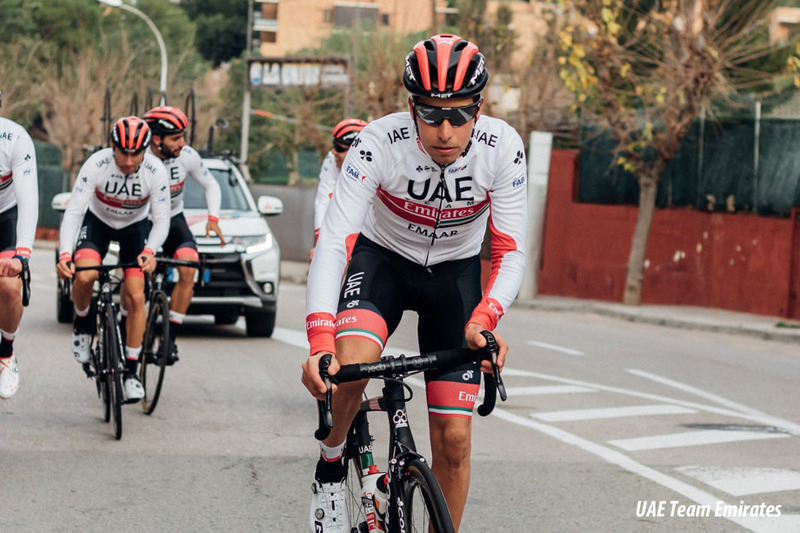 16th, Fernando Gaviria (UAE Team Emirates) started as one of the top favorites for the win in San Remo, but the sprinter couldn't follow on the Poggio: "I just didn't have the legs. We were also well placed on the Poggio, but I couldn't follow when the puncheurs accelerated. It is normal for them to ride away, but I gave everything in the hope of returning. I have to improve a little to be able to actually win." 42nd, Greg Van Avermaet (CCC) was not part of the decisive leading group: "Normally I am always there. However, this time it did not work. I was just a little too far back on the Poggio. I tried to move up, but Deceuninck - Quick-Step kept the pace very fast. This made it very difficult to win places. I then lost some strength at the end. I felt OK, but certainly not super. This is of course a big disappointment." 10th, European champion Matteo Trentin (Mitchelton-Scott) put in a big attack in the finalé instead of waiting for the sprint, but was pulled back by Wout van Aert: "I made the right choice by attacking, I'm heading for the win and it was a good choice to attack. Almost nobody rode in the final. Only Sagan, Michal Kwiatkowski and I wanted to continue. The rest just looked at each other. Tenth, eighth ... What difference does it make. I can be satisfied with my race, as I was able to follow the strongest rider on the Poggio. But I am not at all happy with my result." Dutch sprinter Dylan Groenewegen (Jumbo-Visma) rode his first Milan-San Remo to finish in 78th place, but was satisfied with his race: "It didn't disappoint me very much. I just have to mature a little bit, get a little bit stronger and then I think it will be fine in one of the coming years. I just got across on the Cipressa and then you still have to cross the Poggio, but that is something for the coming years. I am happy with my performance today. The course knowledge that I have gained is very important. I will certainly take with me how the hills, the descents and the roads." 11th at just 3 seconds, Tom Dumoulin (Sunweb): "I tried to follow on the Poggio, but I didn't have the punch in my legs. I knew Michael Matthews was trying to make the cross behind me, but he didn't succeed. Even if I had held back to help, we would not have joined, so that is a great pity. We have done everything today and I have a lot of respect for the way Michael came back after his crash." Michael Matthews (Sunweb), like Dumoulin, only just missed out and finished in 12th place at 8 seconds: "I am happy to be back. I raced around with a big smile up to 60 kilometers from the finish, then the legs started to hurt. For me it was a good day personally, I survived the Poggio and the Cipressa and that with only one and a half fitness in my legs. So the shape is good, I just have to get a bit more course hardness." But the most disappointed must be Trek-Segafredo's John Degenkolb who had held the climbers on the Poggio for a mechanical to ruin his race. Degenkolb was riding the SRAM 1x12 speed group and the chain got stuck, has everyone forgotten about the problems the Aqua Blue team had last year? Degenkolb spoke about his Sanremo: "The first monument of the year is done, and it’s actually a big disappointment for all of us. Until the bottom of the Poggio, everything went perfect. It was really good to arrive in good shape with good legs. My position going into the climb was not great, so I had to suffer a bit to stay in the group there and make a good position. Then, it split in front of me, but even then, there was still a chance to come back, I believe, and then I had a mechanical and then the race was over." 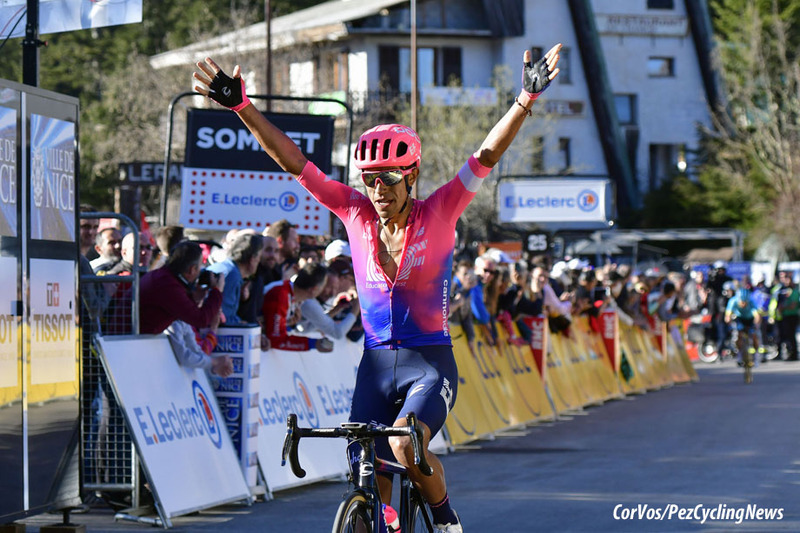 You can read more quotes from the top eight finishers bellow and the full PEZ Sanremo Race Report HERE. France’s Julian Alaphilippe of Deceuninck - Quick-Step claimed his first Monument as he out-sprinted Belgium’s Oliver Naesen (AG2R-La Mondiale) and Michal Kwiatkowski (Sky) and Peter Sagan (Bora-Hansgrohe) from a front group of ten riders that escaped on the Poggio following an attack made by Alaphilippe and Simon Clarke (EF Education First). He’s the third rider to win Strade Bianche and Milano-Sanremo back to back after Fabian Cancellara in 2008 Kwiatkowski in 2017. 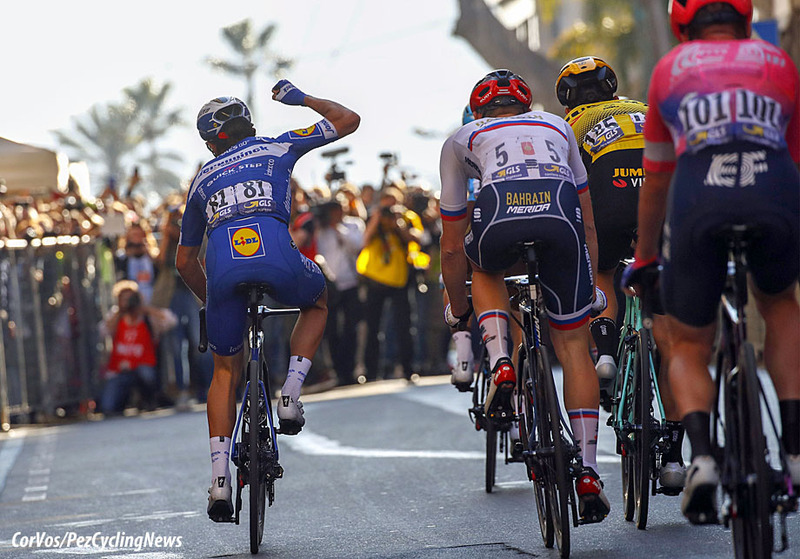 After nearly seven long hours and a nerve-wracking finale, Julian Alaphilippe punched the air in celebration as he captured a memorable win at Milano-Sanremo and continued his period of unprecedented success, which sees him sit on seven victories amassed since the end of January, having taken a win at every single race he had started this season. Tim Declercq confirmed his “El Tractor” monicker, taking the reins at the front of the peloton as soon as a ten-man breakaway formed and setting a steady tempo which resulted in the escapees being brought back on the Cipressa, after more than 250 kilometers. The headwind on this penultimate ascent meant no attacks could be launched, the only move before the Poggio coming on the descent, where Niccolo Bonifazio (Direct Energie) opened a gap. 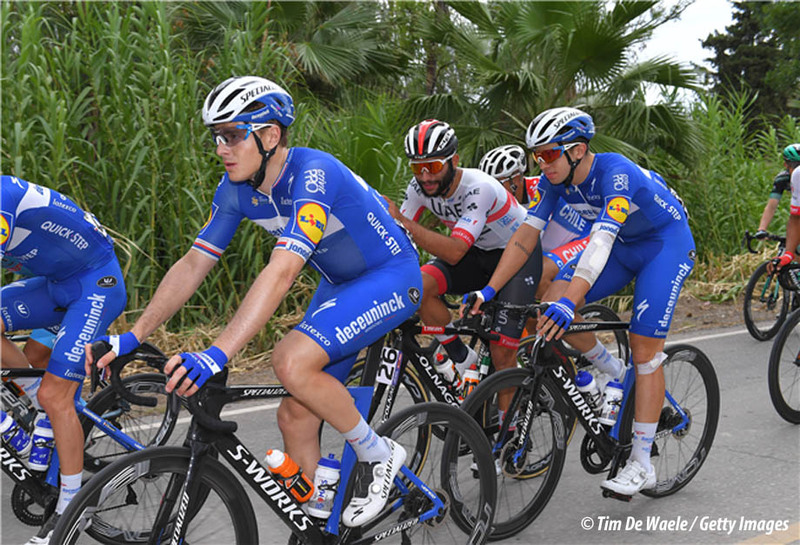 Belgian Champion Yves Lampaert then took over and led into the Poggio before Philippe Gilbert and Zdenek Stybar set a brutal pace that inflicted pain and suffering, stretching the field and dropping the sprinters. Once the Omloop Het Nieuwsblad champion peeled off the front, Simon Clarke made his move followed by Alaphilippe. This tore the bunch apart and created the decisive split. Eleven riders rushed towards the finishing straight with a clear gap over the remnants of the peloton. A late attack from Matteo Trentin (Mitchelton-Scott) was pulled back by Wout van Aert (Jumbo-Visma). Through the final bends Matej Mohoric (Bahrain-Merida) hit the front. Sensing the opportunity, Alaphilippe jumped on his wheel and opened his sprint with just over 200 meters to go, holding off Oliver Naesen and Michal Kwiatkowski for the most important victory of his career. See the PEZ Sanremo Race Report HERE. 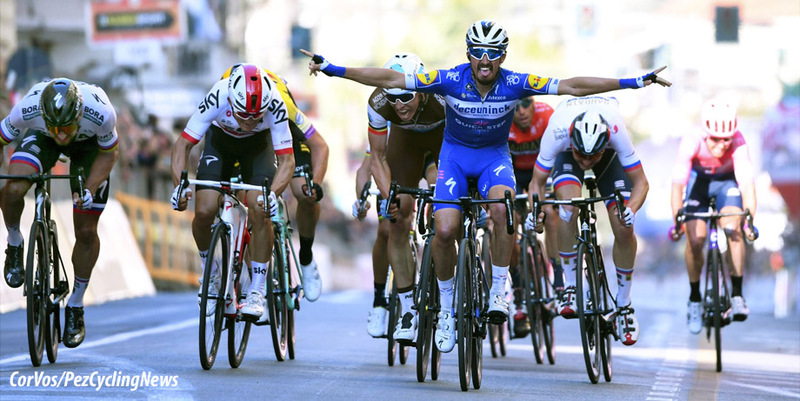 2019 Milan-Sanremo winner, Julian Alaphilippe (Deceuninck - Quick-Step): "It’s very difficult to realize what I achieved today together with this amazing team! There was pressure on me, but I knew the form was there and together with my Wolfpack teammates I did a perfect race. Tim pulled the entire day and then, on the Poggio, we tried to make the race very hard with Philippe and Styby, and afterwards I attacked as late as possible to forge a selection. On the downhill I tried to recover and remain focused, then in the last two kilometers I said that I want to win, and after closing the gap to Trentin, I continued to remain attentive, so when Mohoric went with 600 meters to go I said to myself it’s now or never. It’s unbelievable. I am so, so proud of my team! Tim controlled the escapees since the start of the day, while Yves, Styby and Philippe protected and brought me into position on the Poggio. Before the race I asked them to make sure I was fifth wheel tops at the foot of the climb and they took care of it. At the finish, everybody was crying and I was so happy and delighted to be able to share this memorable moment of immense joy with them." 2nd, Oliver Naesen (AG2R-La Mondiale): "I have no regrets. I did my best to be on the podium. I never made a mistake during the entire race. In the sprint, I had room to produce my effort. But I could never get past Julian's rear wheel. I saw who was going to win Milan San-Remo, and I could do nothing about it. It's a funny feeling. I feel very strong right now, I'm not stressed at all. I'm comfortable and I try to encourage the same feeling for my teammates. We rode really well together all day, and we perfectly paced the Cipressa. After a very good Paris Nice, I was expecting to be in front today. With the legs I have right now, I cannot wait to race in Flanders next week with the E3 BinckBank Classic and Gent Wevelgem." 3rd, Michal Kwiatkowski (Sky): "It’s a good result to be on the podium but being so close to the victory leads to thinking about what I could have done better. I dreamt to win today but Julian was the strongest rider today. I think everybody saw what he did on the Poggio. Having the legs to sprint the way he did after that is absolutely impressive. It was a nice feeling for me to be with the best riders in the front group. I’m really happy that Team Sky gave me the opportunity to go for another one." 4th, Peter Sagan (Bora-Hansgrohe): "I felt quite well today, not at my usual form, but better than the previous weeks. The finale of this year's Milano-Sanremo played out as I had expected. A big group reached the bottom of the Poggio and then a strong pace was set at the front with a number of attacks. I knew I had to be there, so I jumped in and closed the attacks when they happened. We split the peloton and we were about ten riders at the top of the Poggio. The bunch wasn't able to bring us back in the descent, so it was a very reduced sprint. I would say it was a strange, very slow one and the final attacks were launched quite late. I was squeezed in and when I found space to sprint, it wasn't enough. Thanks to my Bora-Hansgrohe teammates for their great work today and congratulations to Alaphilippe for his victory." 5th, Matej Mohoric (Bahrain-Merida): "We had studied the race tactics to help Sonny Colbrelli stay in the first positions in the finalé. The race was tough and Sonny lost the wheels of the best on the Poggio. I stayed with Vincenzo and we tried to anticipate the sprint. We did not succeed, but I am happy with my 5th place. I feel good and go to Belgium with a certain optimism." 6th, Wout van Aert (Jumbo-Visma): "I thought that Trentin’s attack was the decisive one, but it came a little too early. Sixth is not bad, but the podium was very close. I felt great all day. On the Cipressa and the Poggio it went smoothly and I crossed the top among the first. This is a great debut in such a race and it has whetted my appetite. I will definitely come back here to aim for more. It is also a confirmation that we worked well during the training camp in Spain last week. This certainly gives confidence for the upcoming classics in Belgium. My form is good." 7th, World champion Alejandro Valverde (Movistar): Alejandro Valverde: "It’s been a spectacular Milano-Sanremo, both because of the high level of racing and the great weather – even a bit surprising, so warm for this time of the year. Being up there with the top contenders and finish inside the first group, after 20 days with no racing, is something to be really happy about. It’s been mostly flat-out in the finale, with no respite, which helped create that selection. Even if I was gaining some terrain on those launching the sprint from the front into the final meters, I wasn’t able to gain back more places and had to stay content with that seventh place. Hats off to Alaphilippe for that huge victory. Now it’s on to this long travel down to Catalunya, another important race in this early part of the season for me, before some more big classics." 8th, Vincenzo Nibali (Bahrain-Merida): "I am happy with my Sanremo. As per tradition, the race started with Cipressa. On the Poggio there was a battle and I managed to return at the end of the descent with 2k to go. I tried to start before the others but I found myself closed and I had to settle for 8th position." 10. Matteo Trentin (Ita) Mitchelton-Scott. Mathieu van der Poel (Corendon-Circus) won the 2019 Grand Prix de Denain-Porte du Hainaut in an impressive solo attack on Sunday. The Dutch champion was in an ambulance last week in the Nokere Koerse and it was feared it would be the end of his spring Classics season, but less than four days later he took the French race solo. Marc Sarreau (Groupama-FDJ) took second place at the head of the bunch ahead of Timothy Dupont (Wanty-Gobert). A leading group of 15 riders made the break of the day. Corendon-Circus had Hansen and Janssens for Van der Poel, they were joined by Tom Wirtgen, Quentin Jauregui, Thibault Guernalec, Maxime Daniel, Damien Touzé, Przemyslaw Kasperkiewicz, Mathieu Burgaudeau, Alexandre Pichot, Guillaume Boivin, Mihkel Räim, Stijn Steels, Piet Allegaert and Bert De Backer were. The peloton kept the leaders within 2 minutes. With an hour left to race; the peloton was down to 60 riders with the escape only a minute up the road. With 40 kilometers to go, Van der Poel chose his moment to turn on the gas and only Alex Kirsch could follow him on the cobblestones. It didn't take long for them to cross to the leading group, where Van der Poel had his two teammates. Roompot-Charles had missed the move and had to chase. Sjoerd van Ginneken dropped leader Lars Boom on cobbled sector three, but it was Marc Sarreau who tried to make the solo crossing from the pack to the Van der Poel group, however, he failed. Ten riders were left out front after an acceleration by Kirsch on the cobbles. They held a lead of around 15 seconds on the peloton. Just before the penultimate cobble section, Boivin attacked, but Van der Poel countered with only Kirsch and Räim able to follow the red, white and blue of the Dutch champion. The trio worked well together, but the peloton kept them in sight. On the last cobbles, 9 kilometers from the finish, it was Van der Poel who took the lead and managed to get Kirsch and Räim off his wheel. Eight flat asphalt kilometers remained to the finish in Denain. Van der Poel held the chasers at 20 seconds and had time to celebrate his victory. Marc Sarreau brought in the bunch 3 seconds after Van der Poel crossed the line, completely exhausted. This was Van der Poel's second road victory this season, after his stage victory in the Tour of Antalya. With a view to the upcoming classics, Van der Poel puts himself on the list of favorites. Next week sees the Dutch champion line-up in Gent-Wevelgem. 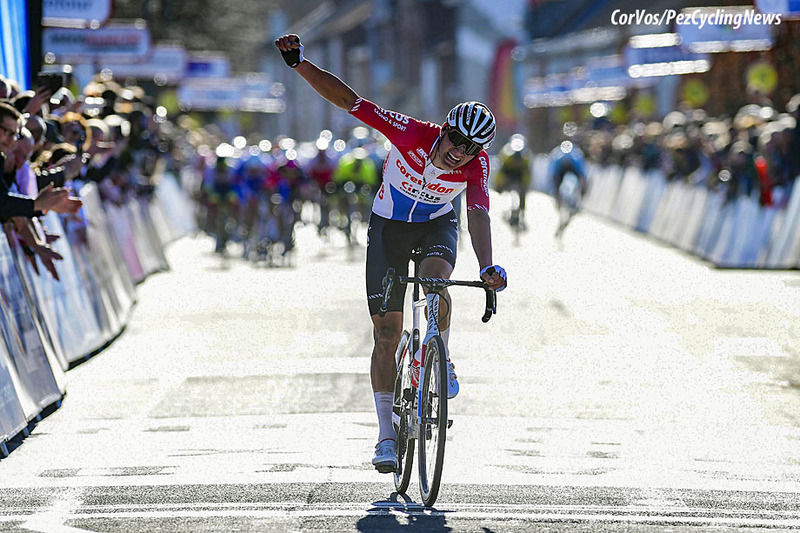 2019 GP de Denain winner, Mathieu van der Poel (Corendon-Circus): "At the start I had some problems with the hip, but once on the course you forget that. We had agreed to make the race hard with the team, we learned that from Nokere. Today we saw how strong the team works for me. Their work was incredible, they rode really fast. I realized that the group behind us was not getting any closer. It was a great punishment from the two of them to keep the peloton off for me like that. I was motivated, on the one hand after the fall of Nokere, to make up for something here. Especially if the team does such a good job for me, it always gives extra moral. Certainly against a large group it was far. I didn't realize at first that I got a gap on the cobblestone, I think this was the best way for me to win for me. I didn't look back once, because when I saw them, I knew that my spirit was going to fall. I only looked back at 500 meters. This is one of the first times that I come in solo at this level, the rest were all in a sprint. I'm proud of that. This was one of the most difficult victories. I was very happy to see the finish. I noticed in Nokere that I was in good shape. Today we had to wait and see how the injuries were going. I would rather not have ridden on the cobbles on Thursday, right after that crash, but I wanted to do the reccon (of the Tour of Flanders). I'm glad I did it." 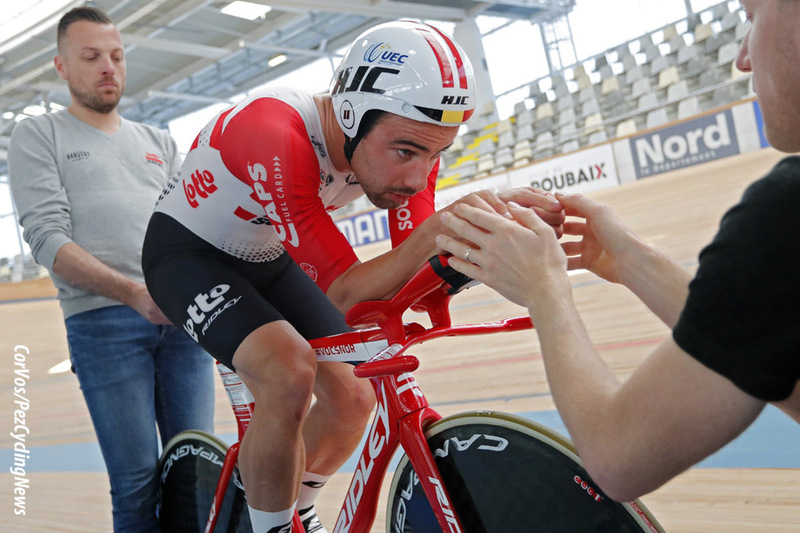 In de Grand Prix de Denain (FRA, 1.HC) on Sunday Yoann Offredo crashed heavily. On the cobbled section Route de Marquette (km 155), the Frenchman (32) was involved in a serious crash. The situation of Yoann Offredo after his crash in GP Denain is stable. He was transferred consciously by helicopter to the CHRU Lille Salengro. Yoann was never in a life-threatening situation. He will undergo additional examinations over the upcoming night in observation. A medical report should be made up on Monday. 10. Romain Cardis (Fra) Direct Energie. 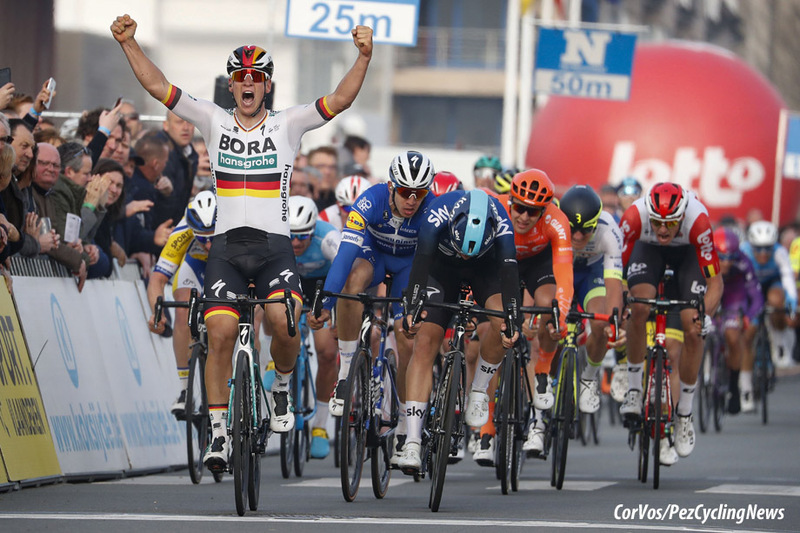 Pascal Ackermann (Bora-Hansgrohe) won the Bredene Koksijde Classic on Friday. The German champion beat Kristoffer Halvorsen (Sky) and Álvaro José Hodeg (Deceuninck - Quick-Step). Until last year this race was called the Handzame Classic, but by moving the finish from Handzame to Koksijde, the name was also changed to the Bredene Koksijde Classic. The Kemmelberg and Rodeberg were the very important in the 197.5 kilometer race, but they are more than 100 kilometers to the finish. There was the problem of strong wind on the roads of De Moeren near Veurne. Six riders took a big lead early on. Andrea Vendrame, Justin Timmermans, Julien Morice, Dimitri Peyskens, Michiel Dieleman and Mathias Norsgaard Jørgensen worked well and had a lead of 7 minutes on the peloton. Deceuninck - Quick-Step and CCC had control of the peloton with last years winner Álvaro José Hodeg, Fabio Jakobsen and Jakub Mareczko. After the Kemmelberg and Rodeberg the lead group was about 3 minutes up. With 40 kilometers to go the escape crossed the finish line in Koksijde for the first time for three more local laps. The lead for the six was just over a minute and a half and so the expected mass sprint was already looking certain. The speed was lifted and the first escapees were caught, 15 kilometers from the finish there was a bad crash that saw the end of the race for Fabio Jakobsen. Deceuninck - Quick-Step also saw Hodeg standing at the side of the road, but the Colombian was able to re-join the peloton on a spare bike. At the start of the last lap only Mathias Norsgaard was still out front. The Dane of the Riwal Readynez Cycling Team only had 20 seconds in hand. A few riders tried to cross and Norsgaard was caught 9 kilometers from the finish. The sprinter teams then took command. Two and a half kilometers from the finish, there was another crash, what was left of the peloton continued racing. CCC and UAE team Emirates led the peloton under the last kilometer banner. In the sprint, Pascal Ackermann went from far out and took the 9th victory for the Bora-Hansgrohe team this season. Race winner, Pascal Ackermann (Bora-Hansgrohe): "I think this showed that we had the strongest team, I had to give something back to the team, that's what I wanted today. And in the end we succeeded. We had a head start in the sprint and before that it was already very hectic. I lost my lead-outs several times, but I was able to return every time. And I had a clear view of this final, because two years ago my first race ended in which I rode to the top 5. It is not easy in this team, because we have many strong sprinters. We must always be in good shape. We want to be one of the best teams in the world, so we have to keep sprinting like that. That is of course a dream for the coming years. But Sam (Bennett) has shown that he is in a great shape. And also Peter (Sagan) rides well. That's why I'm here." 10. Rudy Barbier (Fra) Israel Cycling Academy. A balanced seven-man team will line out at the start of the prestigious event. First held in 1911 and boasting a rich and beautiful history as well as an impressive list of winners, the Volta a Catalunya is one of the oldest stage races on the calendar, part of the World Tour since 2005 and a real climbers’ delight. For the 99th edition, the race will once again take on a well-known path, meaning there will be no bonus seconds, no opportunities for time trialists and limited chances for sprinters, even on the so-called flat stages. Two consecutive mountain top finishes – Vallter 2000 (12.7km, 7.4%) and La Molina (12.2km, 4.5%) – the traditional Montjuic circuit in Barcelona and a total of 29 classified climbs, these will be just some of the highlights of the race that will take place between 25-31 March. World Team Ranking leader Deceuninck – Quick-Step – winner of two stages at last year’s edition – will go at the start of the season’s ninth World Tour stop with a squad comprising Eros Capecchi, Dries Devenyns, Alvaro Hodeg – who in 2018 wore the leader’s jersey after surging to victory on the opening day, in Calella – James Knox, Vuelta a España stage winner and runner-up Enric Mas, Fabio Sabatini and Petr Vakoc. “Our squad is a balanced one, giving us a shot at both a stage win in the sprints and a good result in the general classification. Hodeg will have Saba to look after him, Petr is getting better and stronger with each race, while Enric – who makes his first outing since putting in a strong showing at last month’s Volta ao Algarve – and James, who’s had a fine start to the season, can rely on the likes of Dries or Eros, both strong and experienced riders who can handle any kind of situation. We expect some unpredictable stages, it’s always the case in Catalunya, and a very hard day on the roads to La Molina, where the GC should be set in stone, but we go there confident and motivated”, said sports director Brian Holm. Eros Capecchi (ITA), Dries Devenyns (BEL), Alvaro Jose Hodeg Chagui (COL), James Knox (GBR), Enric Mas (ESP), Fabio Sabatini (ITA), Petr Vakoc (CZE). Sports Director	Brian Holm (DEN) and Geert Van Bondt (BEL). Sander Armée, Thomas De Gendt, Bjorg Lambrecht, Rémy Mertz, Maxime Monfort, Jelle Vanendert and Harm Vanhoucke. 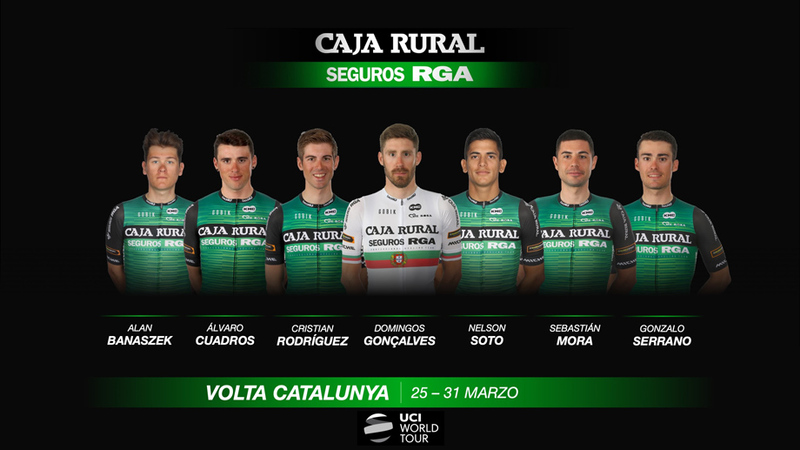 Caja Rural-Seguros RGA returns to the competition on Monday in its first World Tour race of the season. 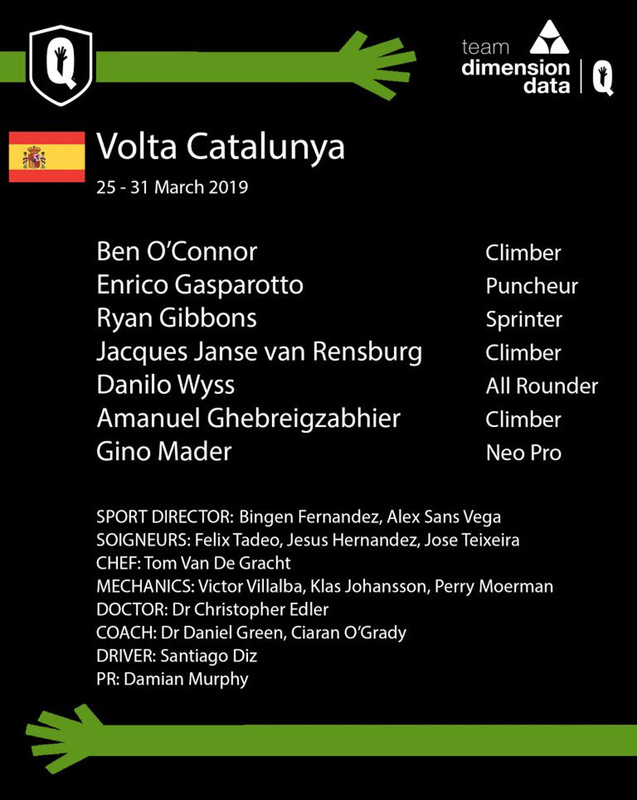 Seven stages for a Volta a Catalunya where the green squad will try to repeat the protagonism shown in the past editions. The Spanish team presents a line up with candidates to stand out in this race. Domingos Gonçalves, Cristian Rodríguez, Nelson Soto, Álvaro Cuadros, Gonzalo Serrano, Sebastián Mora and Alan Banaszek create a very young team, where only the Portuguese champion and Mora overpass twenty-five years old. Volta a Catalunya starts with two arrivals to Calella and Sant Feliu de Guixols where the sprinters won't have it easy. Then, two mountain stages with finish at Vallter 2000 and La Molina will clear the first positions of the general classification. Sant Cugat and Vilaseca, the real opportunities for the sprinters in this race, will precede the traditional final circuit of Montjuic. One of the newcomers in the Volta is the Spaniard Gonzalo Serrano, who has complete a remarkable start of the season in Mallorca, Valencia or Algarve. In addition, he got an eighth place in the Classica da Arrabida, being an important piece in the triumph of his teammate Jonathan Lastra. Gonzalo Serrano: "It's been a good start, with good feelings. I know myself better and I'm much more confident in the race, it's my first Volta Catalunya and the first WT that I will attend this year, with a very demanding route, especially the third and fourth stage. We are aware that the best teams and riders are here, but we come with extra motivation from Portugal and we hope to get a good result too." We return to Catalunya for the 99th edition of Volta a Catalunya with a strong team for the week-long race. Ben O’Connor finished 11th in the GC last year and will be looking to replicate his performance in 2019. There will be a few chances for the sprinters, and Ryan Gibbons will be in action for us. Stage three and four both culminate in summit finishes, which will be decisive in the GC battle. The race draws to a close on Sunday with a circuit around the beautiful city of Barcelona. Ryan Gibbons: "I’m looking forward to a good week here at Volta Catalunya. It’s been a while since my last race and I’m eager to see how the form is after a solid start to the season. It’s a very strong field here this year, but we have a good group of climbers here and I’m confident I’ll be in the mix in the “sprint” stages. The weather is also forecast to be pretty good, so fingers crossed it stays that way and we can have a successful week here in Spain." Ben O’Connor: "It’s going to be a really hard week in terms of the parcours. Last year I surprised myself finishing 11th, so it’s a main aim now to try and be into the top 10. The group we have is super strong, with Ryan also our man for the few sprints. It’s one of the main goals going through into the Giro, so it would be great to come out of this with smiles, some results and boxes ticked!" The 99th edition of the Volta Ciclista a Catalunya will be held from March 25th to 31st and as is tradition it features a course that suits climbers, with two demanding mountain stages, but there will be some good opportunities for sprinters or for the breakaway too. 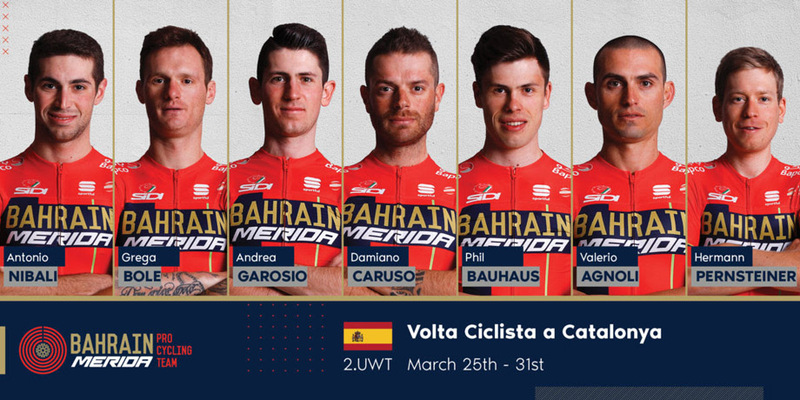 For this reason Bahrain-Merida will head to the third oldest stage race in the world with a balanced line-up, as team Sports Director Vladimir Miholjević explains: "Hermann Pernsteiner and Damiano Caruso will be our overall contenders, but they will also seize the opportunity and take the risk to try to win a stage. There will be 4 stages that are supposed to end with a possible reduced bunch sprint, where Phil Bauhaus will be our man. We know that on Catalunya there are high possibilities for a breakaway to come to the finish, especially after two mountain stages, with uphill finishes at Vallter 2000 and La Molina ski resorts, that will be crucial for the general classification. We are approaching Volta Ciclistica a Catalunya with the aim to achieve the best possible result both in each stage and in the general classification. We will try to use every chance to bring home a result, using experience and tactical moves in the right moment." The Volta a Catalunya will start with the traditional stage in Calella, although it is expected to be tougher due to some climbs. Then, as every year, it will be decided in Barcelona, with 8 laps on the Montjuïc circuit. Damiano Caruso, Hermann Pernsteiner, Grega Bole, Andrea Garosio, Phil Bauhaus, Antonio Nibali, Valerio Agnoli. Dan Martin already counts one Volta a Catalunya overall win and two stage wins in his palmarès: "Volta a Catalunya is always a race I look forward, even more so this year with my family being roadside for number of the stages" Martin said. "I know the course well since I live in the region and racing Volta a Catalunya nearly every year of my career I know the roads well. So far this season has been consistent so hopefully we can continue to race well as a team, but Catalunya is a wide open race this year. Every day will be important and a very strong field of top riders means it will a good, tactical race: I feel good, so we shall see what happens." "A few days after I abandoned Paris-Nice, I began to feel better," said Fabio Aru. "The Volta a Cataluyna is a race that’s very hard, I’ll see in the first stages how I’m feeling and what goals I can reach. I have a desire to do well, so I’m taking on this race with a positive mindset." Wanty-Gobert Cycling Team has received an invitation for the Critérium du Dauphiné (2.WT, 9-16/06) for the fourth consecutive time. 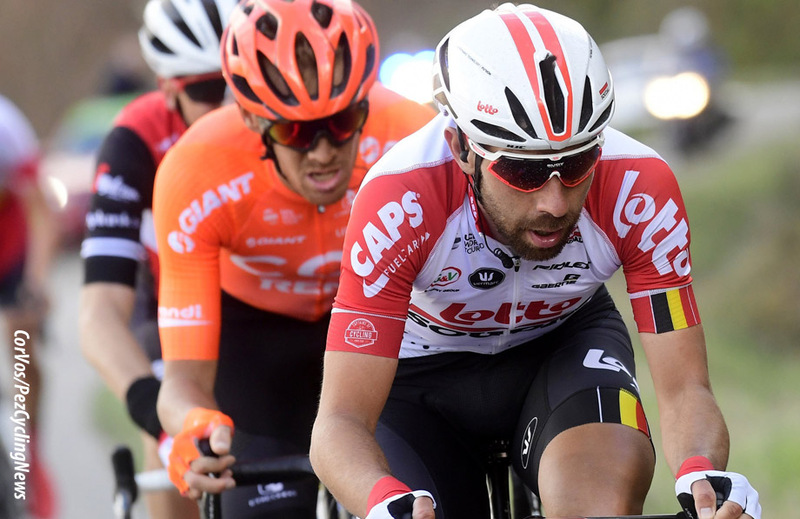 The Belgian team will be able to benefit from the French stage race, organized by ASO, to strengthen the condition just a few weeks before the Tour de France. The Critérium du Dauphiné will start in Aurillac, in the Cantal, on June 9. Last year Guillaume Martin finished several times in the top 10 places mountain stages and finished 12th in the final classification. 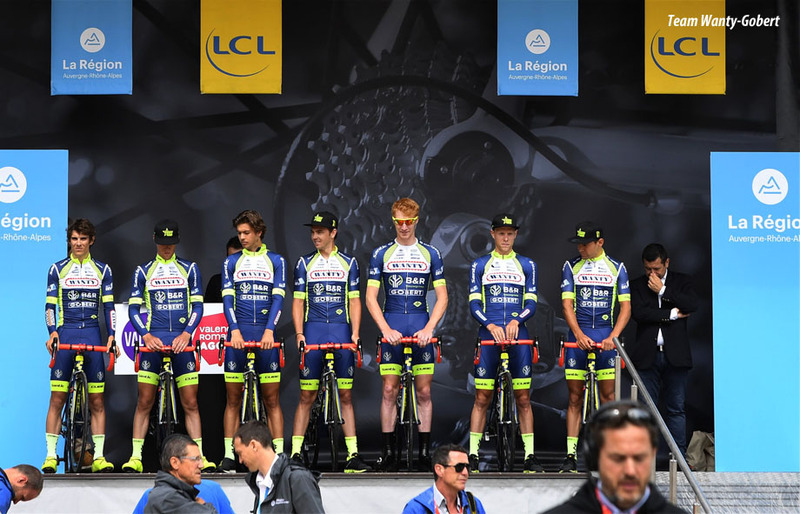 The preparation program of the French climber should pass the Critérium du Dauphiné. Guillaume Martin: "This announcement is of course great news! The Dauphiné is a very important race heading to the Tour de France and will be an almost obligatory preparation race: you will find the same type of stages, the same organization, the same competitors ... I have good memories of this race and I always felt good there. So I cannot wait to line-up in June. Thanks to ASO for this invitation!" 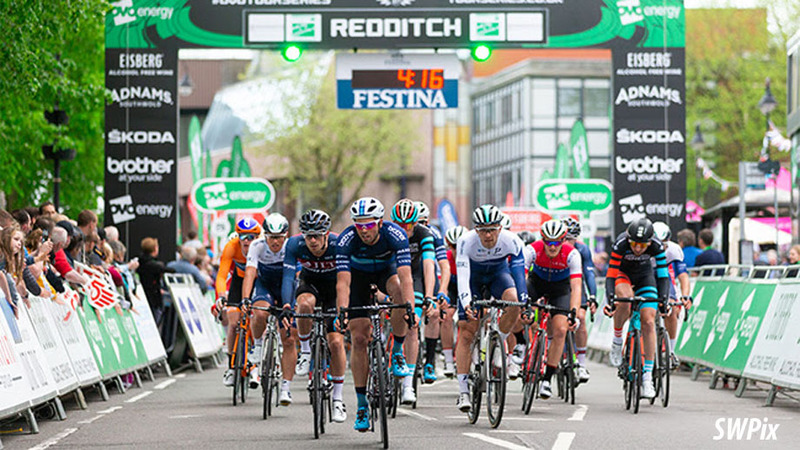 Having hosted the event annually since 2012, the country’s leading teams and riders will return to Redditch on Thursday 9 May, almost exactly one year on from when JLT-Condor and Team Breeze triumphed in the men’s and women’s 2018 series openers there. This year marks the third year in a row that Redditch will host round one. The elite races, which will be preceded by an afternoon of community-based activities, will once again take place on a 1.4-kilometer (0.9-mile) circuit that starts/finishes on Church Green West and includes the challenging climb of Unicorn Hill. "Redditch has been a cornerstone of the OVO Energy Tour Series," said race director Mick Bennett. "Last year’s round in the town attracted a fantastic crowd of 16,000, and I’m sure that anybody who comes to watch Britain’s best riders in action on Thursday 9 May will once again see plenty of fun and fast sporting action – all for free!" Redditch is the fourth venue of this year’s series to be announced, following the news that the Scottish doubleheader of Motherwell and Aberdeen will return on Tuesday 14 and Thursday 16 May respectively. 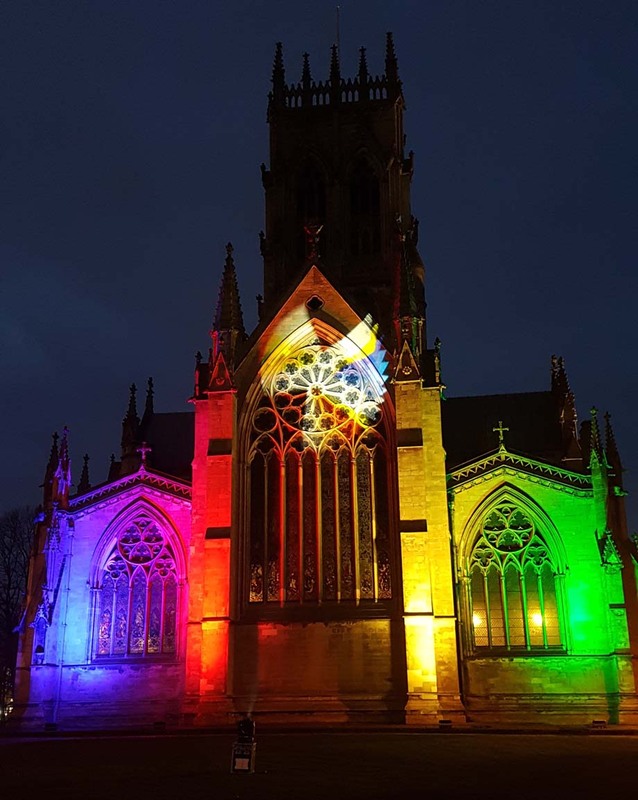 Birkenhead will then welcome the event for the first time on Tuesday 21 May as part of the area’s celebrations as the Liverpool City Region’s Borough of Culture for 2019. The bands (blue, red, black, yellow and green) were specially chosen as a nod to the rainbow jersey which is awarded to the winners of the individual time trial and road race events at the Championships. The world champions then have the honor of wearing that jersey for a full year of competition – making it one of the most iconic prizes in the sport. The Championships commence on the Sunday with the maiden Mixed Team Time Trial Relay and the program continues through to Sunday 29 September with Individual Time Trials and Road Races for Junior (Under 18), Under 23 and Elite male and female riders. More information about the 2019 UCI Road World Championships can found at:www.yorkshire2019.co.uk. On Sunday May 12, 2019 the 3rd edition of the Wanty-Gobert Bike Day will take place at the Grand Place in Binche. The Hainaut city, with the seat of our main sponsor Wanty, is preparing to receive the start of the third stage of the Tour de France. In the 100 days leading up to the passage of La Grande Boucle, the city is dressed in yellow and organizes numerous activities before the passage of the riders. Binche celebrates the Tour with Wanty-Gobert on May 12. After two editions at the Lacs de l'Eau d’Heure, Wanty-Gobert is heading for a new tourist attraction. In the cyclos, cycling tourists can accompany our pro cyclists alongside beautiful paths. The 'Ruffus' family tour provides a stop at the Agaises vineyards. The routes of 50 km (Balade des éoliennes), 80 km (Balade des ascenseurs) and 120km (Balade du Center) are the other possibilities to ride. Numerous activities are also planned in our sponsor village. You can bring a guided visit to our team bus and meet our riders, including the local rider Ludwig De Winter. Ludwig de Winter (professional cyclist from Binche): "The passage of the Tour de France in my city of Binche will be a highlight, both for cycling fans and for local folklore. 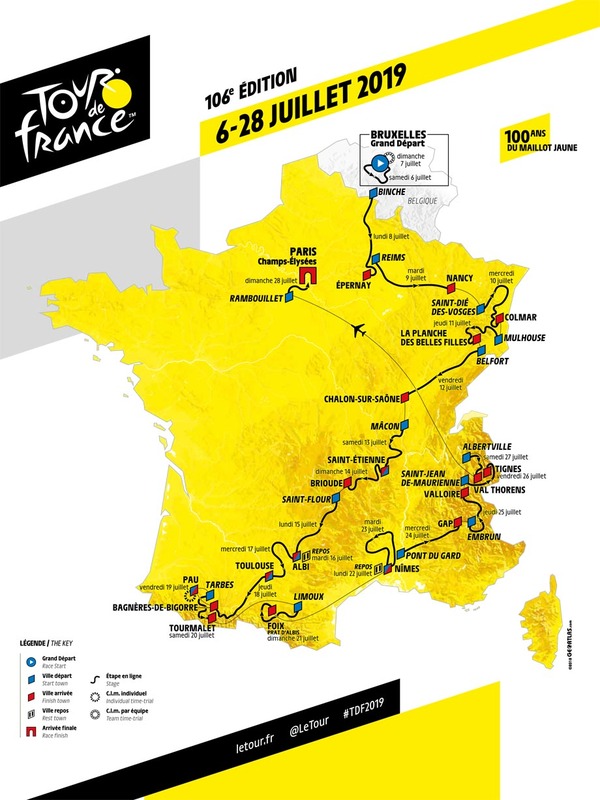 It is of course a dream to participate in the Tour de France, especially when a stage departs 1.5 kilometers from my door. Binche-Chimay-Binche is always an exceptional day, so the Tour will be all the more beautiful. I look forward to participating in the various local events, including this Bike Day on May 12. 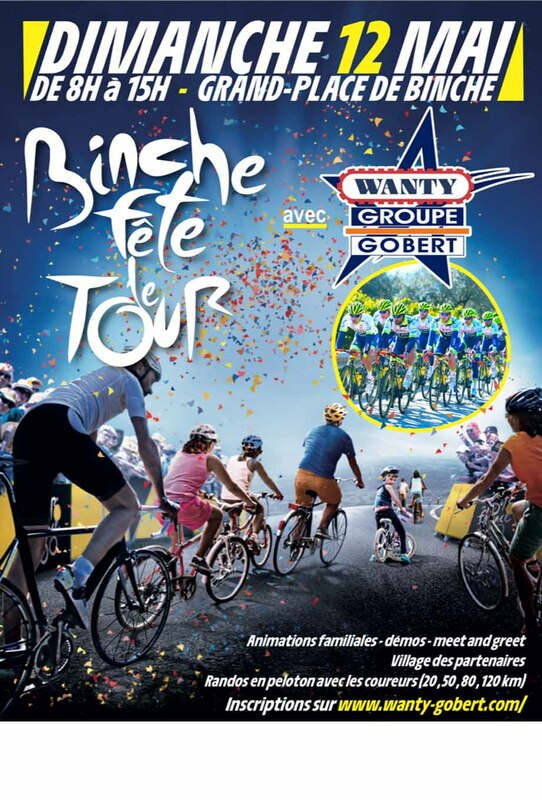 On that day the city of Binche will celebrate the Tour de France with our Wanty-Gobert team. I would like to be part of the Bike Day, on which I hope that the cycling tourists will accompany us on the 50, 80 or 120 kilometers of rides along my training routes." Laurent Devin (mayor of Binche): "During the Tour de France presentation in October, I was asked if a Gille could be present at the start of the Tour. Of course not in carnival outfit on July 8. But with Ludwig De Winter in the ranks of Wanty-Gobert, our regional team has conquered its third wildcard for the Tour de France. Now we can afford to start dreaming. In any case I am pleased that the Wanty-Gobert team has accepted our invitation to participate in this build-up to July 8."